I'd already designed one using DesignSpark PCB before the new HAT outline was announced with cut-outs and EEPROM. Note I updated the board mech. spec today with some notes on how to do mounting holes the 'recommneded' way - i.e. make sure they are isolated (NOT electrically connected to GND or any other net) and preferably non plated (non plated holes can generally be drilled to tighter tolerances). Basically make them the same as on a B+ and you're good. James Adams wrote: make sure they are isolated (NOT electrically connected to GND or any other net) and preferably non plated (non plated holes can generally be drilled to tighter tolerances). Basically make them the same as on a B+ and you're good. Yes, this was all considered and the template follows that, thanks. Since the spec is defined in metric and Eagle works with imperial, the header in my version is 0.0005" off compared to yours. It's all well within tolerance and it's going to fit, but I think I prefered imperial in the spec (as a big proponent of the metric system I can't believe I'm actually saying this). I also noticed the rounded corners on the display flex cutout in your version are a bit too big. Spec says R=2mm, and I think yours are 3 or 3.5? Thanks for the detailed check... Please raad the answer below and let me know if there is an error in the answer of the template. In Eagle you can switch between metric and imperial on the fly. During this template creation I switched this probably 5 or 6 times (to metric for outline and to imperial for components placement). panik wrote: the header in my version is 0.0005" off compared to yours. Displayed offset might occur due to some rounding. If you switch to metric and check the dimensions, they should match. panik wrote: I also noticed the rounded corners on the display flex cutout in your version are a bit too big. Spec says R=2mm, and I think yours are 3 or 3.5? - if these two points are [2,2]mm apart and the angle of the curve is 90 (or -90) degrees, then the radius is 2mm. Ah yes, it seems you're right. I've probably only looked at it with my third eye. But even with my real eyes they look much smaller in the pdf. Sorry to cause confusion! I don't have the display slot on my own board so I didn't measure twice as I did with the rest. And switching between metric and imperial is a pain in the third eye. Mine was off because yours is more precise. It's not fixed in the pdf yet, but I'm sure it will be soon. panik wrote: Just a heads-up; as it turns out, the "R=2mm" in the drawing is a mistake. It should be "R=1mm"
Ok, I've updated the template (URL of the zip is the same, as listed in my initial message). I have created a full-blown EAGLE component library which contains (among other boards & shapes) the RasPi model B+ HAT. in Martin's Bastelstube --> http://bastelstube.rocci.net/projects/M ... -GPIO.html. Please send any kind of comments / complaints / bug reports / improvement proposals etc. to me. I'm an utter novice at this sort of thing, though, and I can't seem to get Eagle to autoroute from the top row of pins to anything else I place on the board. What am I doing wrong? I'm assuming that it thinks the tolerances are too tight, but even making the nets thinner doesn't seem to help. dickon wrote: I can't seem to get Eagle to autoroute from the top row of pins to anything else I place on the board. What am I doing wrong? I'm assuming that it thinks the tolerances are too tight, but even making the nets thinner doesn't seem to help. Trace width is just one parameter. What might prevent autorouting success is clearance - check values of these parameters. Hint to find out which parameter should be aligned (if you _really_ need to use autorouter): create manual trace and verify the design -> an error/warning will list conflict details. Does anyone know a fabricator/circuit board printer out there that will actually print these, rounded corners and all? Most companies will happily make PCB's with rounded corners, http://www.eurocircuits.com/ is one of them. Thanks for this, I needed the basic layout for a hat I'm making with RJ11 connectors to the GPIO pins. I do not understand one thing about EEPROM connection in the HAT standard. Does asserting EEPROM jumper shortens 3V3 to GND? In my understanding shortening 3V3 to GND would damage entire Raspberry Pi and HAT, right? If you mean the J3 header, it doesn't short 3V3 to ground. It just pulls the WP pin low to enable programming. When not connected the WP pin is pulled high through R1 (1K) to 3V3. Hi, sorry for the remedial question, I'm new to PCB board design. 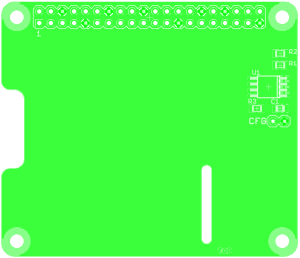 I downloaded the HAT template that FlyFish shared, and added the component from raspberrypi_bastelstube_v13. 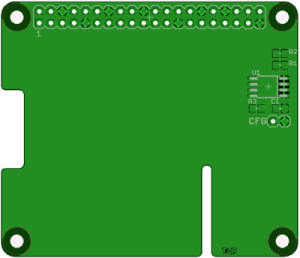 It is a single image of a hat board with a connector. CORRECTION 2/8: the RASPI_BOARD_B+HAT component pictured here is from the raspberrypi_bastelstube_v13 (http://eagle.autodesk.com/eagle/download/254) library, not the FlyFish brd/sch download in this thread. How do I drop components on the board surface and align them to this template, do I just align by site over the image, then remove the image later? Do I add my own connector, or route lan's to the existing image? Last edited by JohnKoz on Wed Feb 08, 2017 5:41 pm, edited 1 time in total. JohnKoz wrote: Hi, sorry for the remedial question, I'm new to PCB board design. You can make a serious design, means put components on a schematics page, wire them up, etc. Then change to PCB and place/route them. Or you can do a 'simple' approach and just add packages to a PCB and connect them by wires. Both actions are related to 'How to use Eagle ECAD tool' and not related to Raspberry Pi. So I suggest to look at some online videos showing how to use Eagle before you proceed with your HAT design. Sorry, I didn't mean to let my PCB experience overshadow my simple question. I have designed PCB's, and already had them manufactured. I've drawn schematics and performed all the steps you mentioned, I consider myself proficient at this point. My question was just how to utilize the template generously provided in this Raspberry Pi thread. The component is a picture (shown above) with no ability to connect or anchor components, since it is just an image. Placing components on the surface will allow me to interconnect components to each other as usual, but I don't know if I'm expected to try and connect them to the provided template, or if that is just a to-scale picture of the board, which is to be removed after components are aligned. I asked the question on this thread, because it provided the context and the original poster who provided the template, and the targeted audience using it. My apologies to readers of this thread, I confused 2 links. One was the link provided in this thread, which was to an actual board and schematic. The other was actually the subject of my question, which was not related to this thread. My question was actually regarding the following library: http://eagle.autodesk.com/eagle/download/254, specifically the RASPI_BOARD_B+HAT component. That is the image which appears in my question. As it is not a brd/sch file, but simply a component, I was asking how it was intended to be used. Again, my sincere apologies to @aBUGSworstnightmare and other readers of this thread. I've pursued my question elsewhere, as to not ware out my welcome on this Raspberry Pi forum. I will post my answer here for completeness when I figure it out. JohnKoz wrote: My apologies to readers of this thread, I confused 2 links. One was the link provided in this thread, which was to an actual board and schematic. the .zip-file in the first post contains two sets of .sch+brd for a HAT with and without slots. Use them as a template, adding components to the schematics page. The GPIO connector is placed correctly already. I'm able to close out the answer to my own question. I had mistakenly added the component (from the library) directly to my board layout, instead of my schematic. As such, it only existed there as an image, instead of an electrical component. Adding it instead to the schematic, gave me an electrical component I could interconnect my other components to as usual, for a complete Hat. Moving then to the board layout, everything appeared in the proper layer as expected, including: Vias, Holes, Pads, Dimensions, etc. Thanks for the replies and the patience.